If you’re like me, you can’t put a VR headset on without dreaming about the possibilities for learning. From a design perspective, VR affords the opportunity to place the learner in any conceivable environment, and more importantly, to make it interactive. That’s profoundly exciting. Filament has already completed its first educational VR project for a client and more are in the works. Of note is the unprecedented diversity of organizations that have approached us with an interest in educational VR applications, suggesting that VR learning games have the potential to be more mainstream than traditional learning games. Even schools are adopting VR! Though nascent, the technology clearly holds sufficient promise to spur entities of all stripes to seriously contemplate its significance. I’m fond of talking at length about the learning game spectrum; a continuum I use to delineate the difference between quiz games like Arcademic Skill Builders, learning or EDU games like Reach for the Sun, and long-form crossover games like Civilization. VR learning experiences are emerging along a similar spectrum, ranging from look-and-learn applications like Google Expeditions and Lifeliqe to highly-interactive applications like Fantastic Contraption. As VR input hardware evolves and hand location tracking gives way to digit tracking (potentially as soon as HTC’s forthcoming second-generation Vive controllers), examples of the latter – though currently rare – will rapidly become more commonplace. Because Filament is primarily interested in how game technologies can be used to deliver deep, authentic, and complex learning experiences, the remainder of this article will exclusively discuss the high-interactivity (and indeed, high-end) end of the VR spectrum. You can interact with virtual objects with your real hands. Formal education is often critiqued for feeling abstract and divorced from reality. Indeed, questions like “why does this even matter?” and “when am I ever going to use this in real life?” are often voiced by students in rhetorical protest to seemingly pointless academic exercises. Games are Filament’s teaching tool of choice because they help eliminate the gap between knowledge and application, but games can still feel distant from reality. Our game Diffission, for example, elegantly teaches how fractions work, but never offers an explicit connection between the game world and the real world. That’s up to the player. As the name implies, VR experiences feel real. Accordingly, learning designers can leverage VR to completely eliminate the disconnect between a given learning objective and its perceived real world relevance, and by extension, increase learner motivation. My son loves Star Wars. 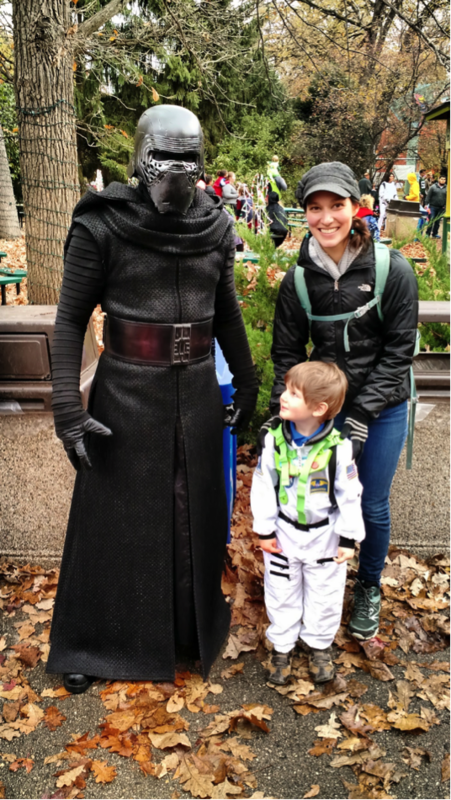 On Halloween, he encountered a professional cosplayer in a pitch perfect Kylo Ren costume. It’s not obvious from the photo below, but he was completely entranced. Seeing Kylo Ren in living color was impactful in a way that Kylo Ren on a screen couldn’t touch. Life in the 21st century is increasingly digitally-mediated, but our brains are still wired to delineate between first-hand, embodied experiences and digital experiences. While both “real” and digitally-mediated experiences can be impactful, we tend to assign more weight to the former. This is why, for example, kids who watch realistically-rendered dinosaurs on TV without difficulty can be terrified of even the most comically-fake animatronic dinosaurs at a live event. It’s also why people value face-to-face meetings and are far more unsettled by violence witnessed in person than on the news. Compelling, presence-inducing VR experiences can be similarly impactful to real world experiences, but can achieve that impact with fabricated virtual assets. In other words, VR experiences can impact users as if they were real, and that’s a big deal. For learning designers, it affords the ability to replicate universally-lauded experiences like field trips and museums without the high cost and logistical difficulties. To be clear: I’m not arguing that VR can – or should – supplant real world experiences. There’s simply no substitute for collecting real water samples from a real stream or marveling at a real suit of armor at a real history museum. Rather, what excites me is the prospect of creating high-impact experiences that would otherwise be impossible or extremely difficult in the real world; for example, collecting dirt samples from Mars or marveling at a virtual suit of armor from a location thousands of miles removed from the real thing. Traditional games are valued for their entertainment value in large part because they immerse players in compelling alternative realities. The immersion factor is essentially the extent to which the game narrows the mental and physical gap between the player and the character they control on the screen. In VR, the player is the character, so the default immersion gap is extremely small. That’s why even menial gameplay verbs (throwing objects, pulling levers, looking under desks, etc.) are surprisingly entertaining in VR. In education, we like immersion because it leads to engagement, which leads to heightened focus and effort, which lead to better learning outcomes. In traditional games, the avatar controlled by the player is often called the Player Character, or PC. The player uses controllers – namely keyboards, mice, game pads and joysticks – to control the PC via buttons, triggers and directional inputs. As mentioned in #3 above, there is no such thing as a PC in VR because the player directly inhabits the virtual space. Because VR is an embodied experience (i.e. the player is the controller), it’s perfect for learning games that endeavor to teach embodied learning objectives; for instance, games about construction, performing surgery, changing a tire, working a crime scene, operating a vehicle, sculpting, conducting lab experiments, etc. At some point, once the hardware is less cumbersome, it will also be great for learning objectives that involve developing muscle memory. VR yoga, anyone? Identity is a powerful teaching tool and a natural extension of embodied play. For example, it’s hard to imagine playing the VR crime scene game above without being steeped in the identity of a detective. Of course, the same could be said of any crime scene investigation game. What sets the VR version apart is that the player physically performs the investigative actions, which reinforces their connection to the identity via embodied cognition. This phenomenon has particularly exciting implications for VR professional practice games: games that let players try on different careers like pairs of shoes. At Filament, we can’t wait to explore these newfound pedagogical powers. And of course, because VR is so young, the above list is likely just the tip of the iceberg. New capabilities will emerge as the hardware evolves (literally the day after drafting this article I learned about the new wireless add-on for the Vive) and as developers dream up novel applications of the technology. So, how do you think virtual reality will impact learning? Is it a game-changer or just another tool in the learning design toolbelt? Sound off on our Facebook or Twitter!